Former Secretary of State Condoleezza Rice will be the honoree of A Conversation With a Living Legend on May 21, at the Westin Galleria. During the already sold-out program, Rice will be interviewed by Brit Hume of Fox News Channel. This time, the seventh annual Houston event will support MD Anderson’s Moon Shots Program, an unprecedented, comprehensive effort to significantly reduce cancer deaths and to transform cancer care, initially focusing on eight cancers. To date, the dinner has raised more than $905,000, an amount that significantly surpasses all previous fundraising goals for the Houston event. Proceeds will be directed to the Prostate Cancer Moon Shot. Since 2007, A Conversation With a Living Legend in Houston has raised approximately $2.5 million for MD Anderson research and patient care initiatives. Chairs Cyvia and Melvyn Wolff share pride that this year’s event will continue the tradition, as MD Anderson is “in the business of saving lives. By supporting this initiative, we play a small role in Making Cancer History,” they said in a statement. In addition to the onstage Rice-Hume conversation, the program will include remarks by Ron DePinho, M.D., president of MD Anderson, and Christopher Logothetis, M.D., chair and professor, Genitourinary Medical Oncology, and co-chair of the Prostate Cancer Moon Shot. 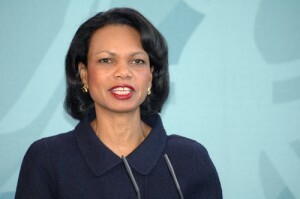 Rice, the second woman and first African-American to hold this post, served as the 66th U.S. Secretary of State from 2005 to 2009. Currently a professor of political economy in the Graduate School of Business and of political science at Stanford University, she also was the first woman to hold the position of assistant to the president for national security affairs, under President George W. Bush, from 2001 to 2005. With more than 35 years of journalism experience, Hume serves as a senior political analyst for FOX News Channel (FNC) and contributes to all major political coverage. He’s also a regular panelist on FNC’s weekly public affairs program, “FOX News Sunday.” Before joining FOX News in 1996, Hume was with ABC News for 23 years, serving as chief White House correspondent from 1989 through 1996.